In a wild game that saw a total of 15 goals at the Spectrum, an Alex Nikiforuk hat-trick and overtime winner saw the Genting Casino Coventry Blaze overturn a 4-0 deficit to claim the two points against their conference rivals, Guildford Flames. Ex-NHL net-minder Matt Hackett made his Blaze debut after replacing Miroslav Kopriva in the week, but it was a tough start for the Canadian. The Flames were white-hot to begin the game, scoring 4 goals in the first 8 minutes. The first came on a powerplay, following an Ivan Puzic high-sticking minor. Kruise Reddick slotting home at the 3.54 mark. From scorer to creator, Reddick assisted the 2nd Flames goal at 6.15, scored by ex-Reading Royal Ian Watters. Brett Ferguson scored the Flames 3rd of the period at 7.15 before ex-Blaze forward Ben Davies registered 37 seconds later (7.52). 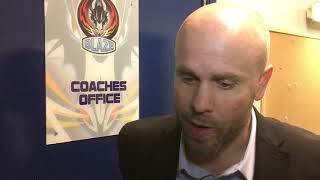 Blaze Head Coach Danny Stewart called a time-out to send a clear message to the team, and sent Brit Jordan Hedley to replace Hackett between the pipes. This started the comeback for the Blaze. Nikiforuk scored the first of what was to be a hat-trick on the night at 13:18. Tim Crowder would end the period on a high, stretching his point streak to 8 games with a goal, assisted by Nicolai Bryhnisveen, the first of 3 for him during the game. The Blaze started the 2nd period strongly, reducing the deficit to 1 goal. Ben Lake, who has points in 5 straight games vs. Guildford, set up Shawn Pauly at 21.49. Last year’s Elite League top goal-scorer for defencemen, Calle Ackered, found the twine shortly after to make the score 5-3, 23.31 into the game. The Blaze would then turn the tables on the hosts, scoring 4 unanswered goals in just over 7 minutes. Chris Joyaux’s 4th goal of the season, on a powerplay, proved the catalyst. The next shift saw Nikiforuk score his second of the night. An assist going to David Clements, whose first goal of the season came in the comeback vs. Glasgow last Sunday. At the 28.41 mark, Lake scored his 21st goal of the regular season to take the lead. Swede Thom Flodqvist, who had a hat-trick of his own vs. the Clan, gave the Blaze a 2 goal advantage (31.15). Just over the half-way mark, Ackered added his second of the night, a powerplay goal at 35.46, to round out the scoring after what was a frantic first 40 minutes. The Blaze led the game at the start of the final period 7-6 and no-one in attendance could predict what the 3rd would bring. It turned out to be a relatively quiet 20 minutes on the scoresheet, which saw a lone goal at 49.45. Guildford’s Kevin King the scorer, a goal that tied the game 7-7, giving each team a point and taking it to overtime. In the 3-on-3 additional 5 minutes, Nikiforuk would be the hero, with Lake providing an outstanding assist to gift a breakaway chance for Nikiforuk to complete the hat-trick and seal the victory for the Blaze. 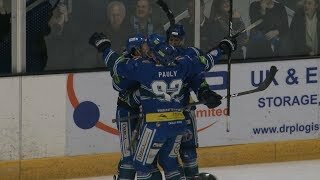 It was his 15th goal of the season, which set a record for Coventry, as overcoming a 4 goal deficit to win, is the steepest comeback in team history.